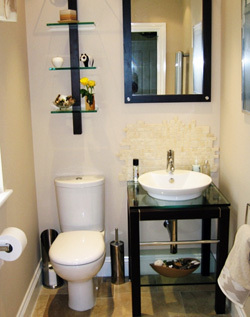 All the details of your bathroom will be finalised and an installation date is set. We then arrive for the first day of installation and will give you the plan of what we wish to achieve each day, how the works will be carried out and answer any questions you may have before any work commences. You will be advised on the progress throughout the whole process. All of our fitters are fully qualified, fully insured and have vast experience in their individual trades. The team consists of plumbers, carpenters, electricians, tillers, roofers and plasterers. We also employ the services of two local builders and structural engineers if the project involves any structural work. Each job is very important to us because we have built our business on our reputation. Every member of our team is friendly, respectful of our customer's homes, and will always be happy to answer any questions. we lay sheets down to protect your carpets and clean all areas on a daily basis to ensure safety and correct etiquette whilst in your home. We also provide a low budget installation only service. This is required when customers source their own equipment. We will inspect all items before installing to ensure they are safe and suitable for your requirements. For more, please feel free to give us a call on 01604 812700 or fill in our contact form.